The previous chapter emphasized the significance of framing processes for the translation of a complex reality into a labelling scheme. This chapter turns the focus to another process in this translation, namely the organizing that takes place behind labelling schemes. For our purposes, it is relevant to employ and combine two perspectives on organizing: first, one broad perspective that focuses on coalitions, social movements, and interaction among actors within the organizational landscape; second, one narrow perspective that focuses on formal organization. A brief discussion of these two perspectives is followed by an analysis of different organizational forms for labelling activities. We analyse three different organized forms in which business and social movement actors, particularly EMOs, interact in labelling arrangements; and we ask whether and how such variation matters. 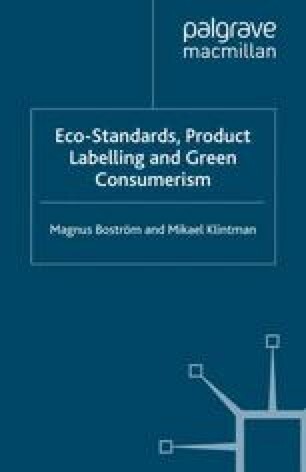 Indeed, organizational form itself is subject to intense debate among stakeholders, because the stakeholders generally believe that organizational form matters both for the efficiency of interaction across actors and for the environmental as well as social outcomes, and not least for the legitimacy of the labelling scheme. Finally, this chapter takes a closer look at some of the major actors involved in labelling, including their motives (or lack of motives), arguments, and power resources.